When I worked as an interpreter, one of the best things about it was eating my coworkers’ food. That’s how I discovered many dishes from all over the world – and how I put on many unwanted pounds…but that’s a story for a different blog. 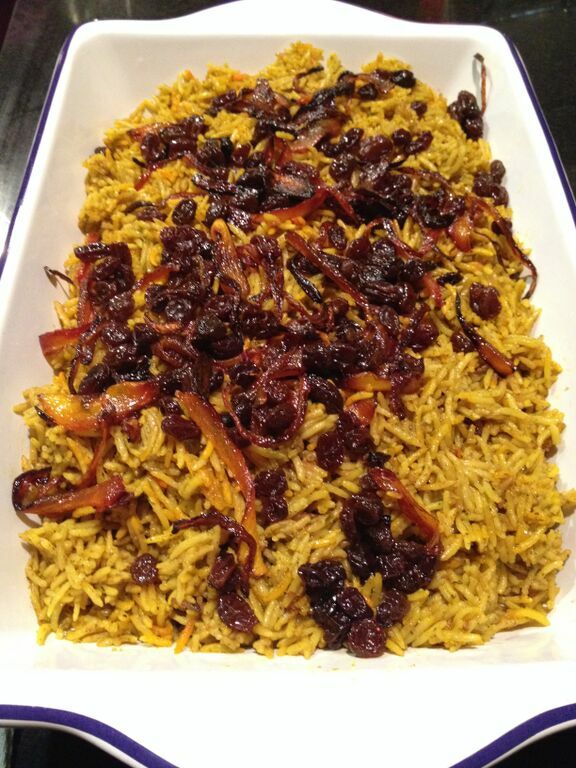 This post is dedicated to one of my favorite people – Layla Guled – and her mouth-watering braised goat and yellow rice. After asking Layla for the recipe and getting the all-too-common “I don’t have a recipe,” I asked her to let me watch her make it. We met in my kitchen a couple of Fridays ago. It was 6 p.m. and we were just getting started. I knew it was going to be a late night. She brought some kebabs from Cheema’s for an appetizer and made Sambusas (which I will include in a future post). Because Layla is Muslim and doesn’t drink alcohol, I drank for the two of us. And because the goat took so long to cook, I was plastered by the time we sat down for dinner. 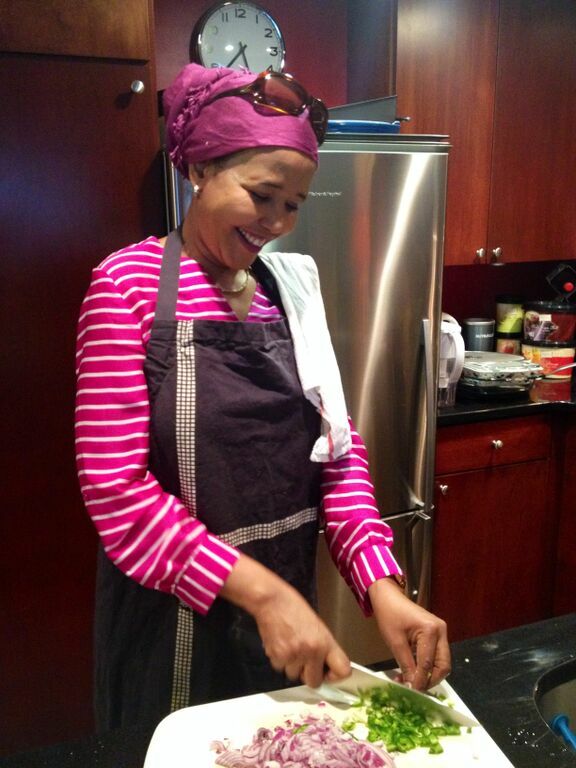 It was a wonderful opportunity to cook with an old friend and ask her lots of questions. But Layla’s fascinating life story is also complicated and full of tragedies – not quite suited for this blog. Layla came to the US from Somalia in the mid-nineties and has since worked as a medical interpreter at Brigham and Women’s hospital. 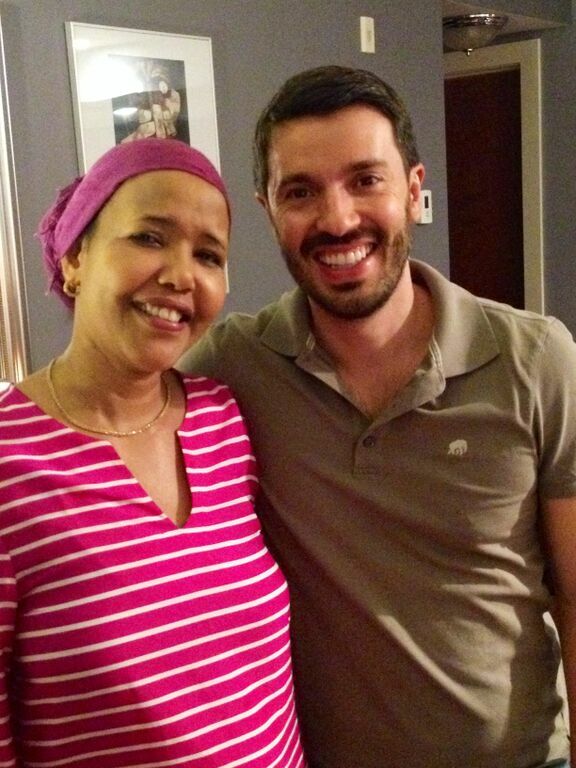 When I worked there with her, it was clear how deeply committed Layla was to the Somali community. If we needed her on a weekend, or in the middle of the night, she would come to the hospital and help her patients. Always. When Brigham and Women’s doctor Nawal Nour wanted to launch a practice dedicated solely to the physical and emotional needs of African women, she called Layla. Together, they launched the African Women’s Health Center in 1999 – the country’s first clinic of its kind. The duo has toured the nation speaking about cultural and health issues faced by many African women. Their work has been covered by the Associated Press, New York Times, Washington Post, NPR, O and Essence magazines, and CNN Español, among others. I love her, too. 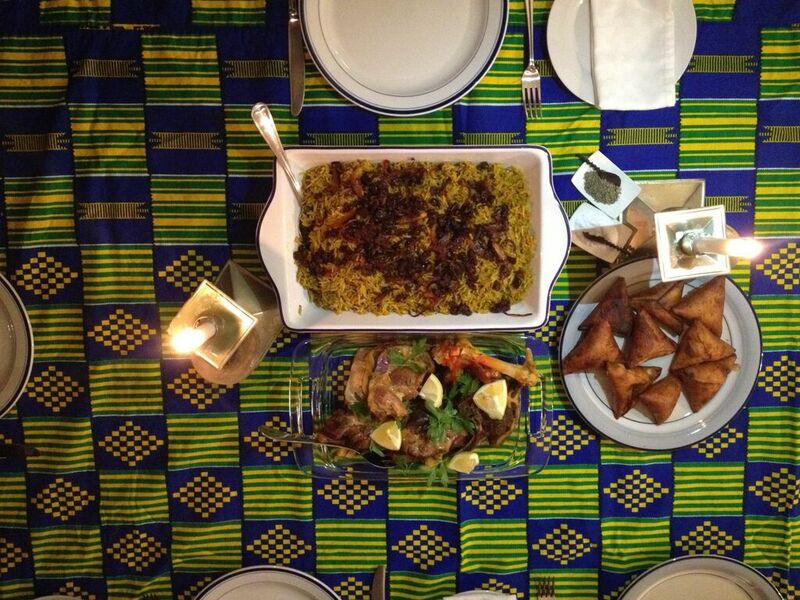 I especially loved her when she brought this rice and goat dish to our potlucks. My love can be bought easily, what can I say. Although these two dishes go perfectly together, you can serve them separately. These recipes will make enough food for a large party (or a week’s worth of leftovers), and the measurements are approximate. Just so you know, I wrote down the recipe before the wine kicked in, so you can trust that the measurements are reliable. Anyway, according to Layla, you can make no mistake. Just throw stuff in, and it will taste good. So try it – you won’t be disappointed. 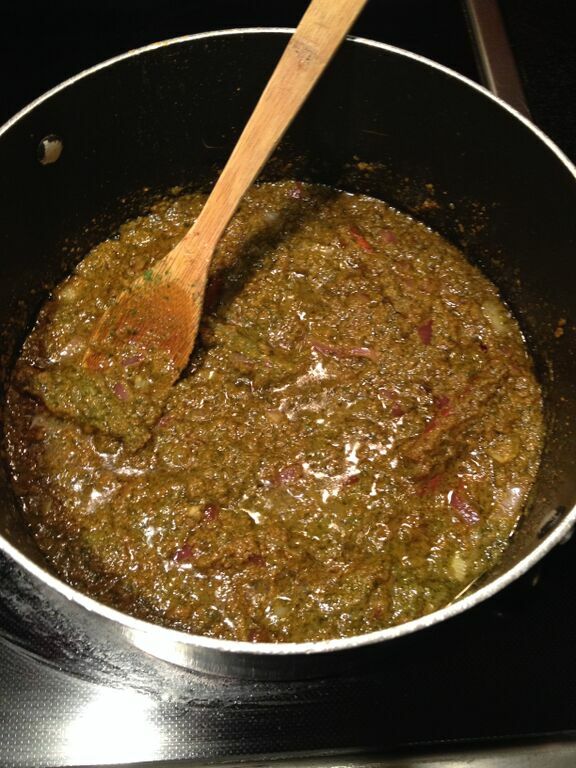 In a blender, combine the garlic, cilantro, ½ red onion, 1 bouillon cube, Adobo, tamarind soup mix, and 1 cup of water. Blend into a puree. Wash the goat meat and put in a casserole dish. Coat meat with ¼ cup of the puree and the vinegar. Cover with aluminum foil and put in the oven for 1.5-2 hours. Add the oil and simmer for a few minutes. Wash and drain the rice and add to the pot. Add 12 cups of water and mix well. Lower the heat, cover, and simmer until the water evaporates (about 20 minutes). Sprinkle the yellow food coloring over the rice and put the pot in the oven, covered, for another 10 minutes. Make the garnish: Slice the remaining ½ onion into long strips and fry. Sprinkle in a pinch of yellow food coloring. Add raisins, mixing well. Turn off the heat and set aside. Take the rice out of the oven and set aside until the goat is fully cooked. The meat is cooked when it starts to fall off the bone easily. You can use a thermometer to ensure it’s fully cooked, but the goat meat does need to cook slowly for a long time to become tender and pull apart easily. Put the rice on a serving dish and add the garnish on top. Serve the goat meat on the side. Bonus! Layla’s hot sauce: In a blender, puree 3 whole fresh jalapeños, 4 cloves of garlic, salt, and water. Use this hot concoction to accompany the meat and rice.